"Vintage Paperback & Pulp Fiction Cover Art"
PC Design's very own Pulp Images Poster! 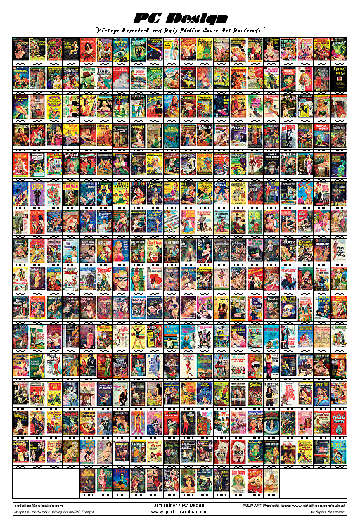 PC Design has for sale a Pulp Poster of all 312 images from our line of Pulp Postcards! This full-color poster measures 13 inches wide x 19 inches tall and is printed on sturdy poster stock. A real eye-catcher, this poster will look great gracing your wall, dorm room, door or anywhere you want a conversation piece of wonderful vintage cover art images! Order a complete set of 312 Pulp Postcards and I'll send you a Pulp Poster for FREE! For non-North American shipping destinations and other shipping options, click on the Secure Ordering link below. Our Pulp Poster is shipped in a stiff mailing tube (2" dia. x 15" long), sealed at both ends, and will arrive at your door ready to frame or hang as is. A small version of the poster is shown above. For a larger view, click on the image. Images �1995-2004 Jeffrey Luther/PC Design. All Rights Reserved. PC DESIGN P.O. Box 4336 Palm Springs, California 92263 U.S.A.